Do you fall in love with all of your clients? 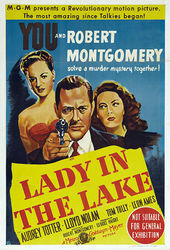 A stream of mellifluous holiday cheer is subverted to open Director/Actor Robert Montgomery's one-of-a-kind film noir, Lady in the Lake. Ursini: We're here to talk about one of the most unusual film noirs and maybe one of the most unusual films in mainstream Hollywood history called Lady in the Lake. When I first saw this movie years ago, I remember seeing the credits and thinking I was in the wrong movie. This cannot be Lady in the Lake. This is a Christmas movie. Is this a Capra movie, or a Leo McCary movie? ...[This] is a very sarcastic, ironic, even nasty movie. It's an anti-Christmas movie disguised as a Christmas movie. These titles set the tone, along with the Christmas carols which carry over through the movie and use of the chorus which [also] carries over – there is no instrumental music at all. Silver: [The titles] are unusual and are immediately ironic as we go from these Christmas graphics with the holly, the ivy, the candles, the deer, and the Christmas star to a gun [which is] not very Christmas-y... the first indication of film noir.